A group made up of CEOs of 17 local employers is advocating for policy changes to create more housing aimed at the middle class, but outside of Microsoft, they have yet to invest any of their financial resources into the problem. The CEOs of King County’s largest businesses — from Amazon and Boeing to Starbucks and Nordstrom — are pushing for more housing for middle-income workers at a time when professionals like nurses, teachers and cops are increasingly being priced out and new housing is aimed mostly at higher earners. Challenge Seattle, a group of 17 local CEOs led by former Gov. Christine Gregoire, released a report Wednesday that amounts to a call for action on more housing aimed at households making between $54,000 and $108,000 (or less for individuals). The group also includes the chief executives of Microsoft, Costco, Zillow, Weyerhaeuser, Alaska Airlines, Expedia and the Bill & Melinda Gates Foundation, among others. Except for Microsoft, the companies thus far have not contributed their own financial resources to spur investment in new housing. Instead, they are advocating for things Gregoire concedes should prove challenging to implement, like zoning reform and changes to real-estate investment that could lower profits. The basic problem is this: Over the past decade, local home prices and rents have soared twice as fast as incomes. The biggest impact has been on low-income residents, but now about 40 percent of middle-income earners spend more on housing than they can afford (defined as more than 30 percent of their income). 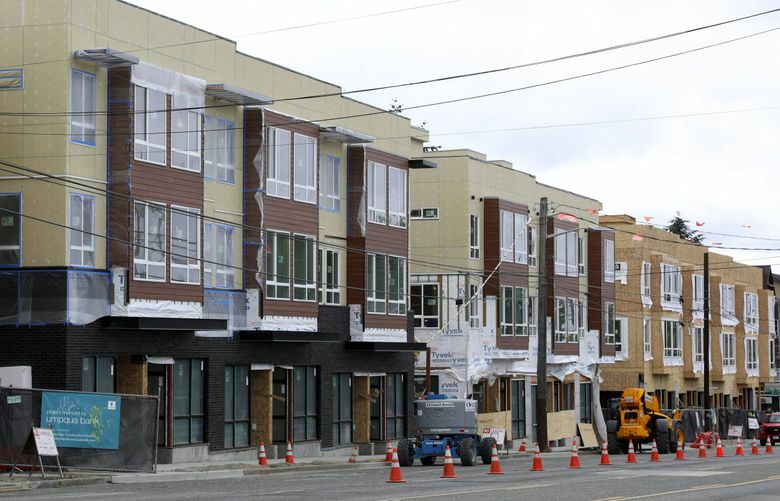 Seattle and a couple of suburbs have seen an epic building boom, yet new housing aimed at middle-class workers has been almost nonexistent. This decade, 85 percent of new county apartments have been luxury units where rents top $2,000 a month — developers do that because it’s the most profitable. On the other end, some nonprofits and public agencies have been building subsidized housing aimed at the lowest wage earners, helped by tax credits and gifts that make those projects work financially. The report outlines some of the effects: A local utility, apparently Puget Sound Energy, has just three after-hours responders left living in the service area that spans Renton, Bellevue, Kirkland, Mercer Island and Newcastle, slowing response times. Local cops, even the police chief of Bellevue, have had to move to cities outside where they serve. The share of commuters driving at least 90 minutes one-way has grown 70 percent this decade. “If a community cannot provide housing to those who are the heart and soul of it — those who respond to disasters, provide health care, teach our kids and so on — then what kind of community is that to live in?” Gregoire said in an interview. The group asks local governments to relax zoning laws to allow for more density, especially near transit. That will be a tough sell in suburbs where housing construction is already weaker than its historical average as residents fed up over issues like traffic and noise fight to protect single-family neighborhoods. However, mayors of nine local suburbs, at the urging of Challenge Seattle and Microsoft, recently signed a letter committing to consider such changes. The CEOs also ask governments to reduce impact fees that help fund projects to offset some of the issues development exacerbates, like traffic, to reduce construction costs. It wants the state to relax laws that make it easier for condo owners to sue developers in hopes the change would spur more condo construction, an effort already underway in Olympia this session. And it wants tax credits used to finance low-income projects to be extended to projects aimed at middle-income earners. The group also wants to challenge the real-estate industry to essentially make less money in the short term, which figures to be an even harder sell. For instance, it wants socially conscious banks and investors to make loans for middle-income housing with below-market interest rates; asks equity partners that invest in developments in exchange for a stake in the project to receive their profits in smaller chunks over a longer time frame; and wants lenders to provide short-term loans for land, the riskiest time for investors to give out loans because projects aren’t certain at that stage. Microsoft, a member of the coalition, made a big splash earlier this month with plans for a $500 million housing fund, including $225 million in loans to help finance middle-income housing at below-market interest rates. But no other member of the group has committed to spending its own money on the problem, even as the housing crisis affects their employees and communities where they are based. Gregoire said the group will consider in the coming weeks creating a housing lending fund similar to Microsoft’s, with its member companies and perhaps other local businesses and even private citizens eligible to contribute. “We’re by no means done,” she said. The companies either referred comment to the report and Challenge Seattle or did not respond to requests for comment. The report acknowledges an obvious self-serving aspect of their efforts — the housing crisis makes it harder for companies to attract and retain employees, and the region risks losing its “economic edge” because of affordability problems. There’s been some momentum toward the middle-income housing issue lately. In addition to Microsoft’s investment, Seattle Mayor Jenny Durkan this week formed the city’s first advisory council aimed at promoting policies to build more middle-income housing, co-chaired by another former governor, Gary Locke.